The Cuesta Rey Cabinet Selection was introduced to the United Stated in 1958. 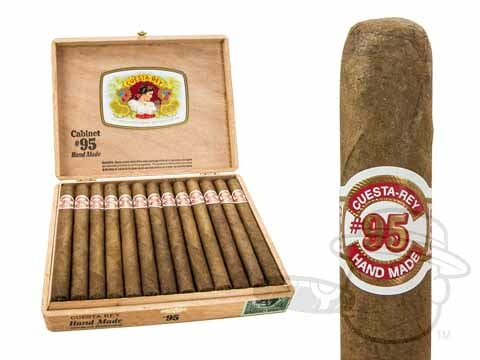 In the beginning, the Cabinet Selection consisted of only one cigar, the Cuesta Rey # 95. The # 95 was extremely popular as it was one of the first premium cigars to be rolled using genuine African Cameroon Wrapper or (ACW). Because of the almost immediate success of the # 95, Stanford Newman added three more sizes to the Cabinet Selection, the # 8-9-8; # 1 and # 2. The Cuesta Rey Cabinet Selection consisted of these four cigars until 1986 when under the direction of Stanford Newman, Tabacalera A Fuente in the Dominican Republic made the first new size in over 20 years, the Cuesta Rey # 1884. The # 1884 was the first Cuesta Rey Cabinet Selection cigar to be rolled with Connecticut Shade wrapper. It has taken thirteen years to add another size to the popular Cabinet Selection, The Cuesta Rey Cabinet # 47. Blended by Carlos Fuente Sr. and available in either African Cameroon Wrapper (ACW) or Connecticut Broadleaf Maduro Wrapper the # 47 is another successful addition to the storied Cuesta Rey Cabinet selection.Today, the six sizes of the Cabinet Selection are all handmade in the Dominican Republic by Tabacalera A. Fuente under the supervision of Carlos Fuente Sr. and his son, Carlos Fuente Jr.Using only the finest aged tobaccos and adhering to the exacting standards demanded by Tabacalera A. Fuente, the Cuesta Rey Cabinet Selection is sure to maintain its position as one of the Worlds' best selling handmade cigars.